ORLANDO, Fla. (AP) — Orlando coach Jacque Vaughn has been waiting for his team to put together a full game. The Magic did just that against a tired Lakers squad. Tobias Harris led the way with 28 points and a career-high 20 rebounds in Orlando’s 114-105 victory over Los Angeles on Friday night. He had a lot of help. Arron Afflalo had 23 points and six assists. Jameer Nelson had 22 points and six assists. 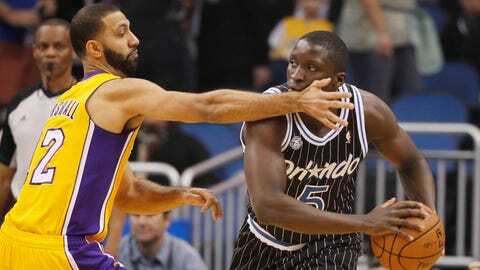 Rookie Victor Oladipo had 15 points, 12 rebounds and five assists as the Magic outscored the Lakers 59-40 in the final 21 minutes of the game. "We haven’t been great in the third quarter the last few games, but this time, we took a punch and didn’t wilt," Vaughn said. "Our first unit responded and the guys who came in off the bench held up their end of the bargain. That was good to see." Harris performance was worth seeing. The third-year pro is starting to show he can contribute something more than offense to a team that needs a little more of everything from him to be competitive. Harris had 19 defensive rebounds as the Magic limited the Lakers to just two second-chance points in the game. "It’s good to go out there and just collect misses and push it up the court," Harris said. "Just being in the right spots, making the right rotations and helping my teammates is the biggest thing for our team." The Lakers looked good for the half of the game, but their energy level dissipated after taking a 65-55 lead with 9:27 left in the third period. They were outscored 36-15 the rest of that quarter and never made a serious run in the final period. This was their sixth road game in 10 days and the travel showed. "The guys wanted to do it, but they didn’t have the legs," Los Angeles Coach Mike D’Antonio said. "We ran out of gas and when you’re tired, you’re not real smart. That’s what happened tonight. We didn’t play with a lot of poise." Pau Gasol led Los Angeles with 21 points and 10 rebounds. The Lakers got 19 points and 14 assists from Kendall Marshall, 17 points from Jodie Meeks and 16 from Nick Young. "I came here saying `I’m going to be tired today’ and I was," Young said. "We’ve been fighting this whole road trip, but I can honestly say this is one of the games we let up a bit. We just lost that focus." The Magic held the Lakers scoreless the last 3:30 of the third quarter, scoring the final 11 points to take a 91-80 lead into the fourth quarter. The Lakers scored the first six points of the fourth period to cut the deficit to 91-86, but that was close as they would come. Orlando responded with an 8-0 run and never let the Lakers closer than six points the rest of the game. Harris had a double-double in the first half with 17 points and 13 rebounds, but it wasn’t enough to give Orlando an advantage. Los Angeles countered with Marshall, who handed out 10 assists and scored seven points when the Lakers took advantage of shoddy Magic ballhandling to squeeze out a 55-53 lead. Los Angeles converted on all seven Orlando turnovers, getting 14 points off the giveaways and shooting 46.7 percent for the half. When the Magic did hold on to the ball, they didn’t have much problem with the porous Lakers’ defense. After shooting 60 percent in the first period, and still trailing 32-28, Orlando used a 13-0 run to overtake the Lakers. Kyle O’Quinn’s slam dunk off a feed from Oladipo ended the run and gave Orlando a 43-38 advantage. Gasol finally ended the Lakers drought, scoring on a pair of driving layups and Meeks followed with a 3-pointer to help the Lakers go in at halftime with a 55-53 lead. NOTES: The Lakers have given up 100 points or more in 11 straight games. … Magic C Nikola Vucevic missed his 10th straight game with a concussion. … The Magic outrebounded Los Angeles 51-40. The Magic are 0-21 in games in which they were outrebounded. … Lakers PG Kendall Marshall is averaging 11.8 assists in the 12 games he has started.